After visiting the adorable Owl Cafe in Harajuku, Ali (Haikugirl) and me were hungry. It was a huge coincidence that we stumbled upon two themed cafes right next to each other in Harajuku’s Takeshita Dori. Ojipan (Ojisan no Panda) is a popular character by Q-LIA – similar to all the Sanrio characters. Speaking of Sanrio, right next to the Ojipan Cafe in Harajuku is yet another great cafe: PomPomPurin Cafe. They’re doing a collaboration called “おじぱんポムの樹meetsオムライヌ”. I’ll definitely try out the PomPomPurin one the next time I’m in Harajuku. As you can see in the photo above they had a really tempting Christmas menu in the Ojipan Cafe, so eventually we decided to go there. The Ojipan Cafe is really easy to find. Just walk straight along Takeshita Dori. Coming from Harajuku Station it’s approximately halfway through Takeshita Dori on the right side. There’s a sign on the building. It’s on the 3F of Cute Cube Harajuku. Just keep an eye open and you won’t miss it. The interior of the cafe is decorated so nicely. So many tiny, adorable details. I can see how much thought and love they put into this cafe. In some theme cafes you have to pay an entrance fee, luckily not in the Ojipan Cafe. It was noontime and as you can see it was almost empty. Only a few Japanese students were also there. I absolutely loved the atmosphere in there! The menu was so cute! In addition to the Christmas special menu we already saw at the entrance, they had so much to offer. It was really hard to choose! Omelette rice with a yummy sauce and broccoli. It was so adorable. I’m glad that despite that I managed to eat it, because it was extremely delicious!! I also ordered the reindeer Ojipan Christmas choco latte. It was totally worth it. One of the most delicious drinks I’ve had in a long time! Ali ordered something from the “standard” menu. As you can see it was uber-cute as well. As I got the Christmas special, I got two presents (see photo above). Yay! The Christmas menu will still be available until 12/25! Should you visit the Ojipan Cafe in Harajuku? If you like cute stuff, pandas and good food, then DEFINITELY! It was a great experience! The food wasn’t expensive, super cute and it was delicious on top of that. The atmosphere in the cafe was so lovely and they put up a lot of effort and thought into the decoration. Have you been to a themed cafe yet? If so, how did you like it? If not, would you consider visiting one? From Harajuku Sta. (Takeshita Exit), walk along Takeshita Dori for a few minutes. 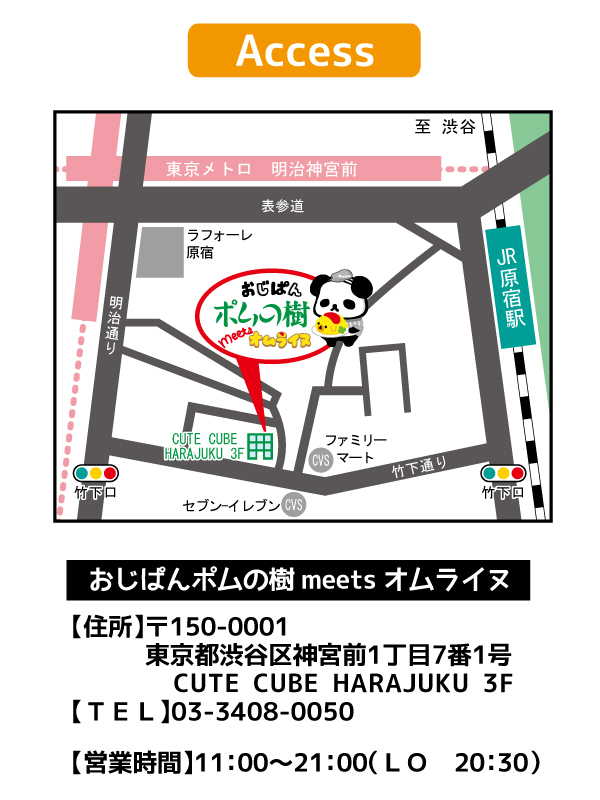 You’ll see it on the right side, 3F of Cute Cube Harajuku. How to Find a Japanese Partner Online? I’ve been to the Gundam Cafe in Akihabara. To be honest, it wasn’t nearly as ‘Gundam’ as I thought it would be. That said, some of the items on the menu were amusing, and I suppose it wasn’t that expensive. Worth a look if you’re into Gundam (which I’m not). The Ojipan Cafe looks to be doing a better job at creating its desired atmosphere, and I’m surprised to see that there aren’t more customers in there (despite the time of day). Looking forward to some recommendations from others. There are SO MANY weird theme cafés and I love trying them out every now and then. To be honest, with the Gundam Cafe, I don’t think you’re missing out too much on that one. Glad to hear you could find a bit of peace and quiet in the Ojipan Cafe. Hey I’m just trying to learn more about Japan’s culture as a whole and I wanted know like whether these themed shops are very popular in Japan on a daily basis? I’m not entirely sure how I should answer your question. Theme cafés only play a role in bigger cities and definitely not in one’s everyday life. It’s more like “an adventure” for the weekend or something to check out with friends like an aquarium, a zoo etc. I think most of those themed cafés are absolutely adorable and I would love to go there! ^.^ Unfortunately, I’m quite sure that I won’t be able to eat anything in those, since I’m a vegan. (Yeah, I know, not the smartest thing to do, when you want to go to Japan.^^) Do you think it’s really disrespectful to go in, only order a drink (maybe I can find something without milk) and enjoy the atmosphere for a while? Otherwise I might have to find someone to go with me and order some food first. :D Which is more fun anyways, I was just wondering whether people would mind me not ordering food. It really depends on the café. Some places have rules as to how much or what you have to order. But usually it’s alright to just get a drink or a dessert or whatever. But it could be difficult to find something vegan in such places.